are basically extinct (CDs, DVDs and vinyl records). In other words, my default mental image is of a company destined to become the next Woolworths. 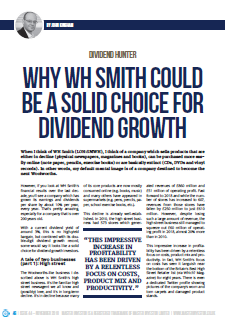 However, if you look at WH Smith’s financial results over the last decade, you’ll see a company which has grown its earnings and dividends per share by about 10% per year, every year. That’s pretty amazing, especially for a company over 200 years old. 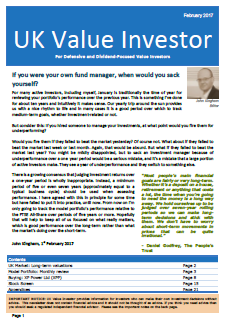 That’s partly why I decided to review WH Smith in my latest article for Master Investor magazine. When I sat down to review the company in mid-October it had a share price of 1,780p and a dividend yield of around 3%, so it was no high yield bargain. However, combined with its double-digit dividend growth record, I thought it looked like a solid choice for dividend growth investors. A really interesting article. WHSmiths has cropped up on my radar so many times over the last few years but the decline in high street retail and generally shabby nature of their stores has always put me off from investing. Having never really looked much closer, it’s interesting to see profit ticking upward even as revenue falls. I saw a tweet this morning that said in effect that purveyors of tat are not necessarily tat investments. And I think that’s true of tatty stores as well. Also, while revenues have fallen slightly, revenues per share are up about 30% over the last ten years because the company has consistently invested in share buybacks. John – Unless you are Gerald Ratner of course — It did for him big time lol ! What a load of old ……. I have this in the mother-in-law’s portfolio and often wondered. The thing I like least about it, as you pointed out, is the high street shops, and they have added to them, potentially adding o a future liability. These have indeed increased their return with cost cutting, but these are unlikely to be repeatable so it could see a reverse down the line and one day there will be less surplus profit from this sector to feed it’s travel addiction. I do like the airport and train station convenience stores, but I think the travel business has probably peaked both in growth and in popularity and it’s still only a 5th of it’s profit today. So the achilles heel is still the downside potential on the 60-80% of the profit on the high street and that will be the thing that will hit the share price at some juncture. Not for me either, WH Smith’s best days are behind it. The international travel business generates about 20% of total profits, but including the UK business, travel is actually larger than the high street business at about 63% of group profits. And while the UK travel business’s growth has slowed, the international travel business is still growing at about 20% per year. Although of course that isn’t guaranteed for the future. Also, I think the high street business could be around for a long-time yet, as long as management give customers what they want, which is keen pricing and convenience, not quality stores. Having said all that, my usual caveat applies which is that I do not own a crystal ball! The 1782p price is from close to a month ago…Does it make sense to post an analysis of a company when: i) the current share price is now 15% higher ? ii) given that there has been a huge acquisition in the US, which could change the rationale for investing? I enjoy reading your pieces, but this one seems to be uninformative. Hi Michael. Unfortunately there’s always going to be a lag with these magazine articles. The deadline for submissions is around the 20th each month, and the magazine isn’t published until the first week of the following month. The November issue came out on the 8th, i.e the tail end of last week. I was in the middle of doing some research so didn’t get around to putting it up on the blog until this week. So there’s always going to be a lag of two to three weeks, but in this case it was nearer four. Usually this doesn’t matter too much as share prices don’t move around all that much in a few weeks, but in this case WH Smith shot up like a rocket, which was mildly annoying, but that’s life I’m afraid. As for the acquisition of InMotion, I wouldn’t call it huge. It’s around £150 million which is slightly more than WH Smith earns in net profit each year. So it’s quite big, but I very much doubt it will prove disruptive (in a bad way) to WH Smith’s existing operations. In fact, I think the acquisition could make WH Smith even more attractive, given that the international travel business (which InMotion will effectively double in size) is the rocket engine behind the company’s ongoing success. So other than the unavoidable time lag and annoying share price jump, I still think the article is useful. It has a reasonably detailed review of WH Smith and mentions my current purchase price ceiling (which is higher than today’s price), although I do agree that mentioning the InMotion acquisition would have made the article more topical. WH Smith has done amazing over the last decade. However, it works in a sector where the margin for error is thin. The business is entirely dependent on the execution of the management team, for this reason, I would refrain from looking at this company. If and when the current team is replaced who knows how competent the new team would be. All the good work done over the last decade could easily be destroyed. The extreme opposite of this is FMCG sector look at Irene Rosenfeld the worst CEO to grace Kraft food she’s has failed to add any shareholder value and had fallen into empire building fallacy. The companies are still profitable because of the goodwill the brands have built up over many decades. Fortunately, Mrs Rosenfeld has retired so maybe the new management can return back to adding shareholder value instead of increasing revenue. Hi Reg, fair enough. Avoiding retail is a common sentiment these days, which is probably why I’m slightly over-invested in the sector. In terms of the impact of good or bad senior management, it’s something I generally try to ignore. My viewpoint is that as long as the company currently has a decent-looking strategy, then I’m happy. There’s always the risk that some crazy CEO will turn up and begin some sort of debt-fuelled empire building phase, but that applies to any company. I’m pretty sure that if I was CEO of Coca-Cola I could drive the company off a cliff in next to no time. I think if an investor understands the sector it does have many many opportunities available at rock bottom price according to Ben Grahams philosophy. The only retail companies I do follow are Burberry, Hermes, LVMH, Kerring and Richmont. My rationale is simple these companies have products with great pricing power and all five companies maintain a vertically integrated supply chain. Therefore it can keep cost down, profits up for a long time and sales figure are relatively consistent so its easy to forecast a rough estimate of turnover, profits and etc. Unfortunately, it seems everyone has clued onto this so stocks for these companies are grossly overpriced current dividend yields are 1-3%. Reg, If you are looking at potential growth in fashion – TED is still doing so and it’s share price is beaten up right now. John did an article on this just recently. Joules is also a very well loved and now sticky brand that appeals to many. It doesn’t have the track record, but it could be a long term real winner. Added to my portfolio today. 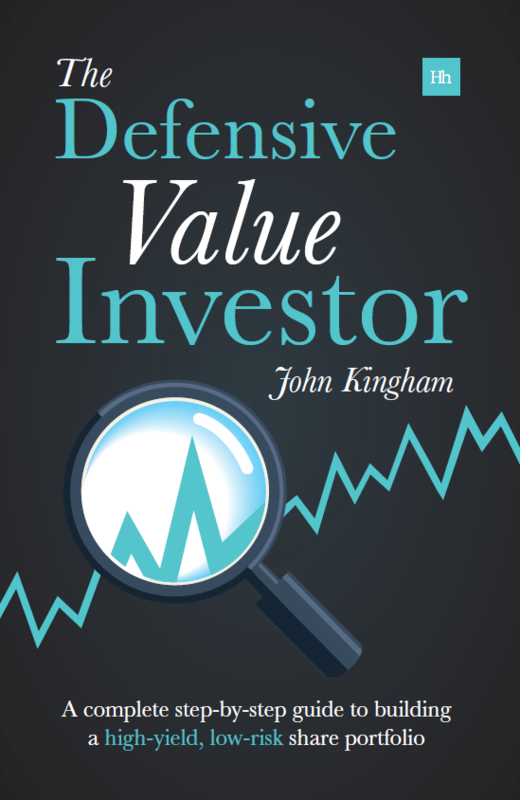 It’s off John’s radar screen though because it doesn’t have the 10 years of listed growth and dividend / profit record, despite it being in existence for 20 years +.